Felix, the cat food brand, has created an entertainment channel on YouTube to analyse the latest trending cat videos. The channel will be called Catdaq, and will be positioned as the world's first trending cat video social "stock market". The channel will host a series of weekly films, presented by Arron Crascall and Jayne Sharp, analysing the week’s cat video trends. YouTube already hosts more than 36 million cat-related videos. Cat owners, including those on Felix’s Facebook community, will be encouraged to submit videos of their own cats to the channel. Created by Deep Focus London, the channel is an attempt to target the next generation of cat owners, and promote Felix as the top cat food brand. Catdaq promises to "help cat video lovers discover the hottest up-and-coming cat videos before everyone else." It says this will solve the "tough" problem of finding the latest cat memes after your friends. Alex Gonnella, the marketing director of Purina, which makes Felix, said: "Felix is an iconic brand in the UK and, increasingly, throughout the globe. 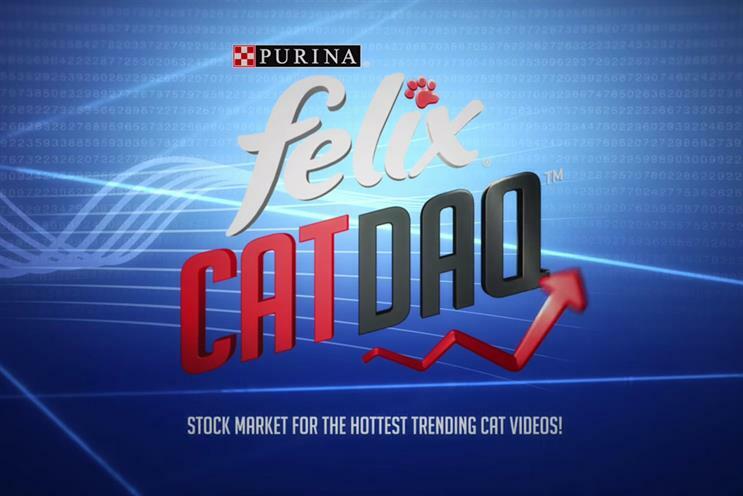 "With Felix Catdaq, we are excited to engage the next generation of cat owners by boldly expressing the mischievous character of Felix in the digital space." Sean Chambers, the executive creative director at Deep Focus London said: "Our approach to the Catdaq content is more like TV episodes than ads, creating an entertainment channel, which feels really unique for the brand and category."